Therapy rooms are equipped with play-therapy dollhouses and figurines to be used as needed with a child’s individualized treatment. The Child Advocacy Center of Sedgwick County held a ribbon-cutting ceremony on Tuesday for its new home located in a former Wichita elementary school. 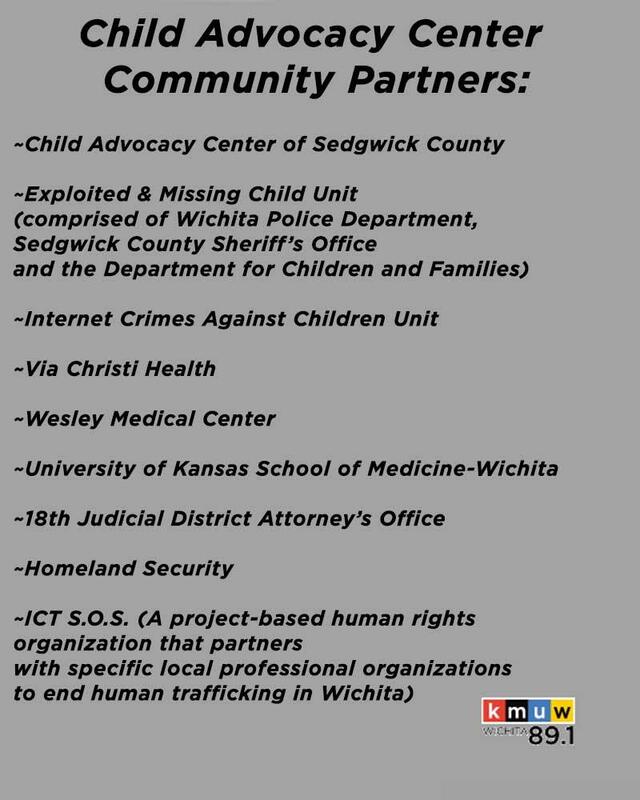 The center houses a multi-agency team of professionals who provide services and treatment for victims of child abuse. KMUW’s Deborah Shaar toured the center recently. Workers are putting poles in place for a 10-foot-high privacy fence that will surround a colorful play structure. There are ramps, a hands-on vertical tic-tac-toe game, and three slides. New turf covers the ground. This isn’t a park: It’s the outdoor space for the new Child Advocacy Center of Sedgwick County. The children who will come here are often facing a difficult time in their lives. They have been traumatized by physical abuse or sexual assault. They might have been abducted. Or maybe, an internet predator manipulated them. "So while they are waiting for an interview, while they’re waiting for therapy or if this is siblings that are here and their siblings are having services done for them, then they come out here and play," says Diana Schunn, executive director of the Child Advocacy Center. "This will hopefully be something that can be used all season long." Schunn says the organization serves about 1,800 children a year. She hopes this playground will help ease the stress that comes with crimes against children. 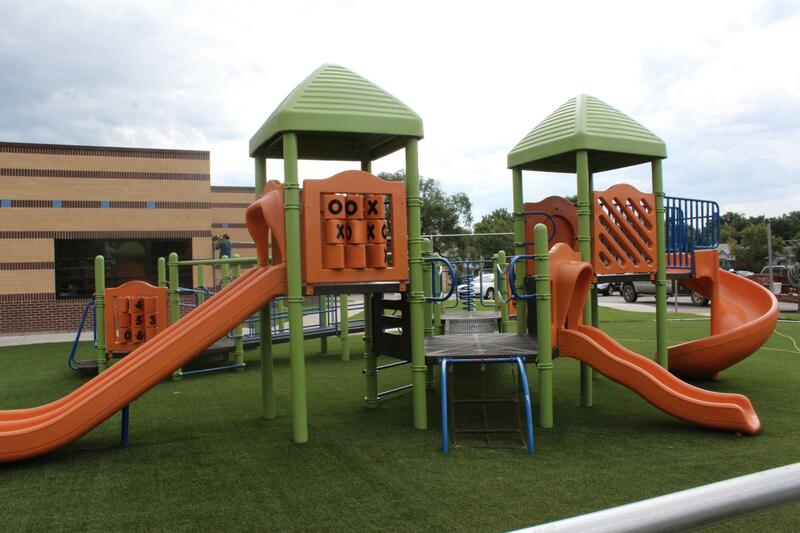 "We repurposed the original playground equipment that was here at the school and had it repainted to freshen it up a bit," Schunn says. 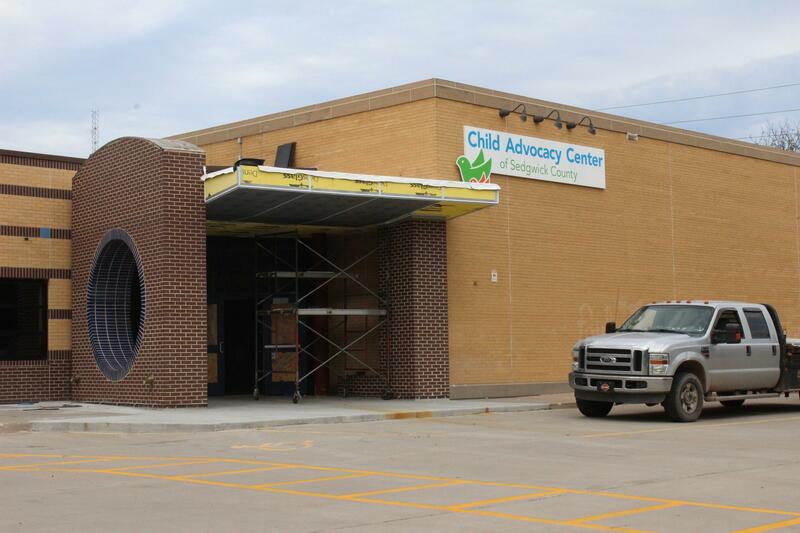 The exterior of the Child Advocacy Center. There’s been a lot of re-purposing and renovating going on here at the former Lincoln Elementary School on the south side of Wichita. It took two years of work and $7 million to transform the 1930’s school building into the Child Advocacy Center. "We looked at well over 100 buildings in the city trying to decide what would be a good repurpose of a current facility as we didn’t want to build a brand new facility," Schunn says. "We’re just very fortunate that the school was interested in selling, and it really was an ideal fit for the needs that we had." Inside the building, most areas are complete. The main lobby where families enter is painted with bright colors and has kid-friendly furniture and a walk-in playhouse. Artist Linnette Lee finishes up a large mural of a tree with a sun that looks a little like a sunflower for the Child Advocacy Center. 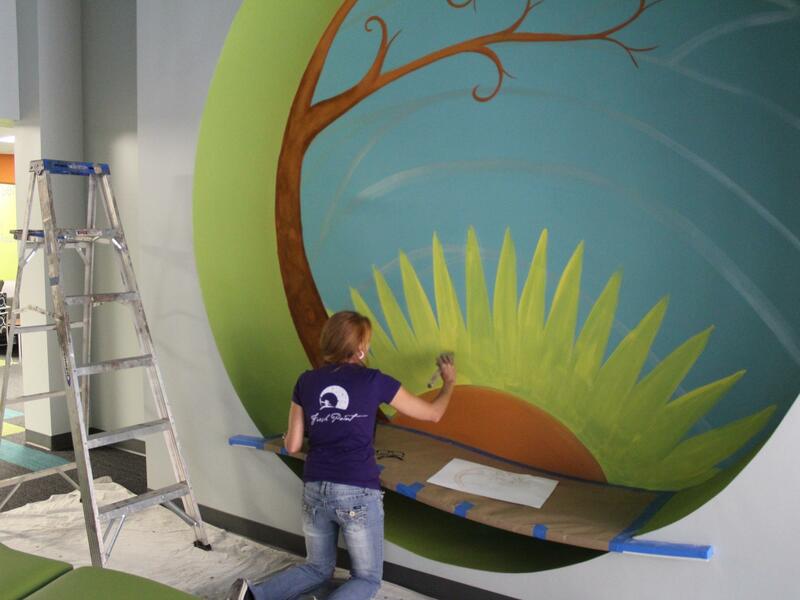 Artist Linnette Lee volunteered her time and talent to paint a mural in a circular cutout on a wall in the lobby. "I just took little aspects from what they have for the facility and put it together to give something fun for the kids," Lee says. The center’s director says all of the areas in the horseshoe-shaped building are designed especially for children and families. There are several comfortable, home-like waiting rooms; three therapy rooms are equipped with play-therapy dollhouses and figurines to be used as needed with a child’s individualized treatment. "They can come in for a series of sessions and then not come in. [It] just really depends on where they are at in that healing process and how much assistance they might need," Schunn says. The rooms where detectives and social workers conduct their interviews with children are purposely plain, with no TVs or pictures on the walls as a way to minimize distractions. 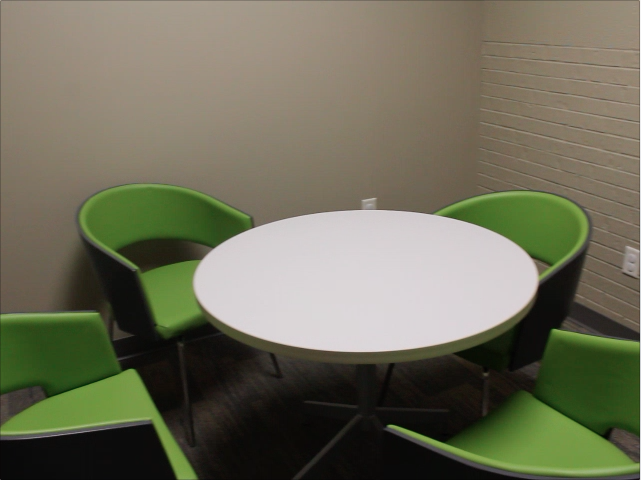 The rooms are set up with different color schemes to help identify and document the setting. Each forensic room has its own individual color scheme. Another new addition is the medical evaluation rooms. They were added so doctors and nurses can see children here instead of at the hospitals. "Children can come when they have their forensic interview, and they immediately have a medical evaluation at that time," Schunn says. "Our goal is to really decrease the amount of times people have to go to alternate locations to be able to receive all the service that they need." The new facility brings 11 agencies together in one place, all to help child victims of abuse and their caregivers. Schunn says 55 specially trained professionals will guide each case through five areas: investigation, medical examination, advocacy, legal and mental health. "We really kind of came together to be able to decrease duplication of services, to be able to identify where additional needs were being identified and then to be able to just enhance the communication and collaboration between all the different partners," Schunn says. The Child Advocacy Center is a nonprofit and serves as the umbrella organization for this multi-disciplinary approach to service and treatment. It’s a public-private partnership that involves city, county, state and private agencies. Sedgwick County Commissioner Tim Norton says there’s great power in having these key players in one location. "Instead of running to Department for Children and Families, or running back to the Internet Crimes Unit or back to the courthouse, now they just walk across the hall or go up the stairs and they’re in a meeting room where everybody’s there," Norton says. "It’s going to save time and money and energy, and it’s going to make us better at handling some of these very, very tough problems." Sedgwick County Commissioner Tim Norton. Norton has been involved with child abuse prevention efforts since the 1980s. 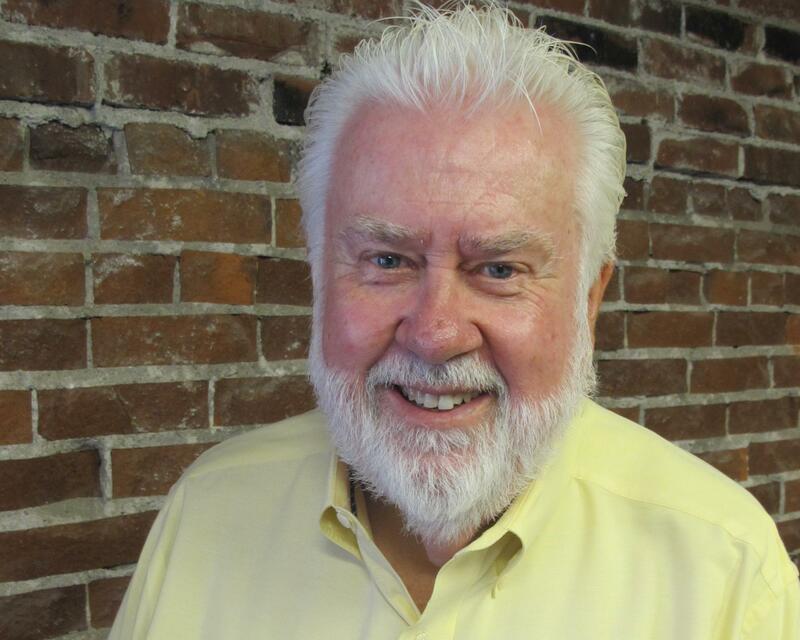 He was on the task force that decided a one-stop Child Advocacy Center was needed. The Sedgwick County Commission offered its support by investing $1 million in the project. "When you know that the sheriff and police and the DA [district attorney] and many government agencies are working on this issue and going to be housed there, it only made sense that Sedgwick County stepped up," Norton says. "We didn’t raise the whole amount, but we let people know that we’re dedicated to it too." The center tries to meet kids’ most basic needs while they are here by providing snacks, clothes to wear to court and even a comfort item or toy to take home. "It becomes pretty important in many of those homes where they don’t have anything they can call their own," Schunn says. "Or, they just left a home that has all of their toys in it, and this is something that they can take with them." 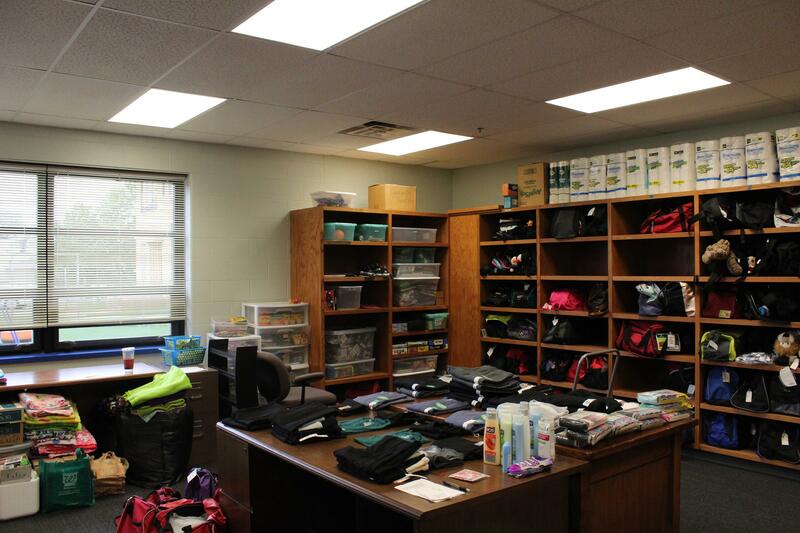 The donation room at the new Child Advocacy Center. The Child Advocacy Center used to be in the basement of a former state office building. There wasn’t enough room to have all the community partners on site. Now, in this larger, stand-alone facility, they are all here, and the center plans to serve more children and increase its community education for child abuse awareness. "We’d love to be able to say we could work ourselves out of a job. I don’t know if that will happen in our lifetime," Schunn says. A Sedgwick County organization that helps child abuse victims and their caregivers will receive a $115,000 state-funded grant.